Close on the hooves of our Skinny Cow report comes further bovine news from Wall Street, which we’ll put under the category of Fatted Calves. Fatted calf is a metaphor or symbol of festive celebration and rejoicing for someone’s long-awaited return. It derives from the parable of the prodigal son in the New Testament. In biblical times, people would often keep at least one piece of livestock that was fed a special diet to fatten it up, thus making it more flavorful when prepared as a meal. Slaughtering this livestock was to be done on rare and special occasions. 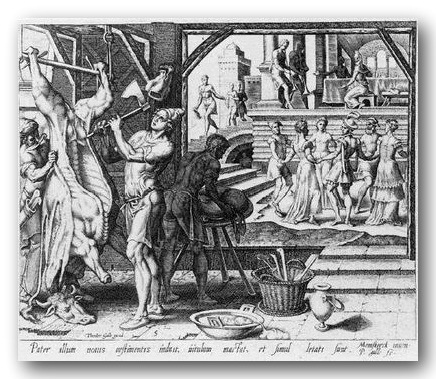 Thus when the prodigal son returns, the father “kills the fatted calf” to show that the celebration is out of the ordinary. Yesterday we learned that Goldman Sachs and John Paulson are accused by the SEC of fattening up a bunch of clueless investors. The Securities and Exchange Commission filed a civil lawsuit against Goldman Sachs for securities fraud on Friday, charging the bank with creating and selling mortgage-backed securities that were designed to fail. According to the complaint, Goldman let John Paulson, a prominent hedge fund manager, select mortgage bonds that he wanted to bet against because they were most likely to lose value and packaged those bonds into the “Abacus” investments, which were sold to investors like pension funds. As those securities plunged in value, Goldman and the Paulson hedge fund made money on their negative bets, while the Goldman clients who bought the investments lost billions of dollars. Strangely, this whole episode came to light not thru regulatory oversight, but from a recently published book on the financial meltdown “The Greatest Trade Ever“ by Gregory Zuckerman. Unfortunately, even though the regulators are now on the case, they have come after the gourmets with civil instead of criminal charges. We’ll take whatever we can get, “Cin cin”.